When I was a little boy, I used to have a turtle named Boxy. He was your typical Box Turtle, one would find on the side of the road. They are very abundant. I also had one named Sandy. Sandy was my first turtle (similar to Boxy) but ran away. How I let a turtle run away from me, who knows, but I remember letting it outside to play, and going inside to get a drink and coming back to find she wasn't there. 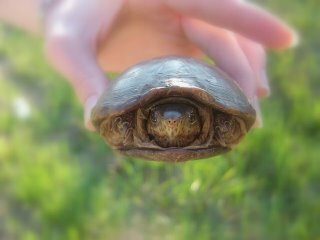 Box Turtles are not the fastest creatures on earth, but they can move when they want to. Boxy, my second turtle, was with me for quite some time. Boxy was very aggressive and would not hesitate to chomp down on your flesh if you weren't paying attention. In fact, if you placed boxy on the ground or carpet, Boxy would chase your feet around (slowly) with mouth wide open. One Day, I took Boxy to a river to play in the water and swim. It was a hot day that day and thought it would be good for him. Well, he floated and kind of kicked and swam and he seemed to be enjoying it. He would lock his target on floating objects and bite down on them and hold it in his mouth until he got tired of holding it. As I watched him, something swam underneath him and snatched him underneath the water. I have no idea what in the world what was in this river that ate turtles, but the river was so murky, I could not see what took him. I still, to this day, believe that Boxy made it. He is a trooper and was very aggressive and I refused to believe that he was killed that day. I never saw him again.